In the last century, and especially in the last 30 years, artists have made maps, subverted maps, performed itineraries, imagined territories, contested borders, charted the invisible, and hacked physical, virtual, and hybrid spaces in the name of cartography. Numerous names have been suggested for various strains of this intersection: ‘psychogeography’, ‘locative media’, ‘experimental geography’, ‘site specific art’, ‘new genre public art’, ‘critical cartography’ (slightly different from the academic versions), and ‘critical spatial practices’. How did we get to this point? Locating the intersection of art and cartography in the last 100 years does not mean that we should ignore the achievements of artists such as Vermeer (Figure 1) or works like the Vatican’s Galleria delle Carte Geografiche, commissioned by Pope Gregory XIII. But prior to the twentieth century, maps were in the background of paintings, and paintings were insets or illustrations on maps. 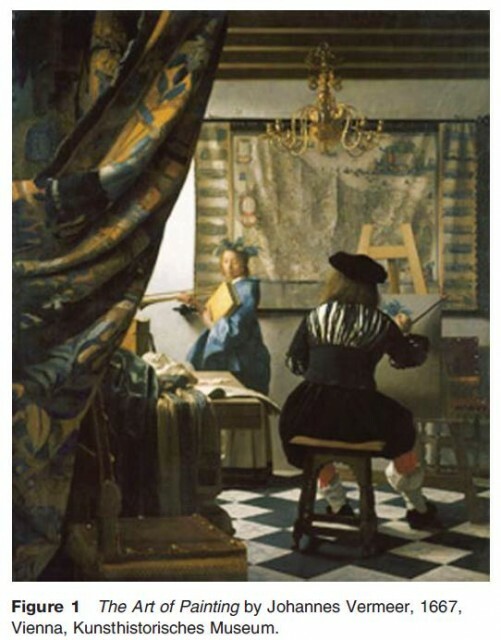 Art and cartography related to each other via visual cues like insets and tiny representations that made the separation between each distinct. It is in the early twentieth century, directly after a wave of globalization (1870–1914), that artists began to engage seriously with cartography in numerous ways. Indeed, globalization plays no small part in the contemporary ‘spatial turn’ of the arts, equally as cause, artistic subject matter, and the professional condition of a field characterized by rapidly proliferating international biennials, conferences, and art fairs. The accelerated accumulation and circulation of capital, conflict, and people around the globe is a phenomenon that required (and is still requiring) diverse societies to develop visual and cultural mechanisms for articulating their relationships to the ‘whole’ world – a world which, economically and technologically speaking, is already right in their backyard. For the sake of clarity, this article discusses three mapping impulses that, against the backdrop of the social and economic changes to everyday life wrought by war and globalization, cut across the twentieth and twentyfirst centuries and characterize contemporary art–map practices. These are loose groupings with numerous overlaps, not rigid categories. The artists chosen to represent these impulses are several out of a field of many hundreds of practitioners across the last 100 years. Symbol saboteurs: Artists who use the visual iconography of the map to reference personal, fictional, utopian, or metaphorical places. Agents and actors: Artists who make maps or engage in situated, locational activities in order to challenge the status quo or change the world. Invisible data mappers: Artists who use cartographic metaphors to visualize informational territories such as the stock market, the Internet, or the human genome.